While these should be the goal of any front yard, the fact is, most homes fall miserably short of their potential. 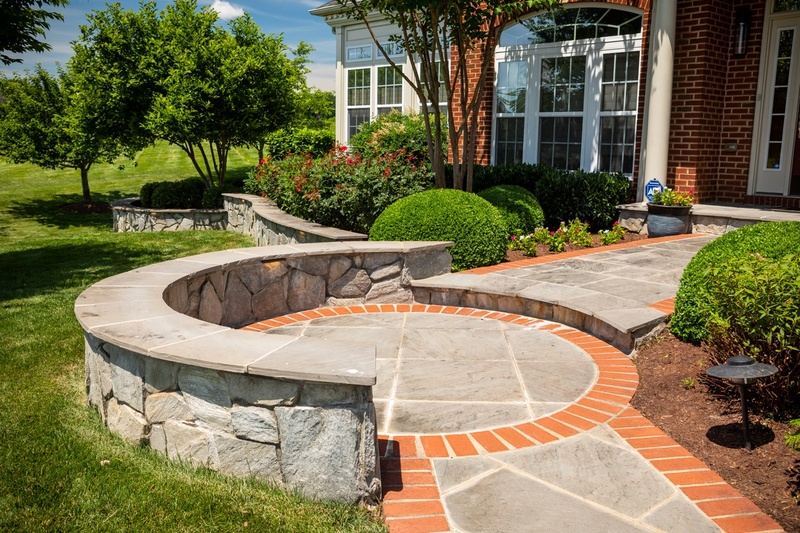 That was the case for this Leesburg, VA landscape design. It was a gorgeous home that had the potential to be something spectacular—but it had a builder’s grade, concrete walkway, almost no landscaping besides a few bushes, and it gave off no sense of “welcome” or curb appeal. Nothing about it was special or unique. 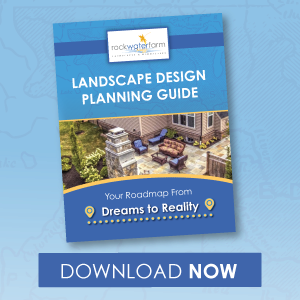 The homeowners were looking for a better front yard landscape design with changes to both hardscaping and the landscaping. A big change they had in mind was a new walkway. Not only was the existing walkway built from cheap material, but it had hard, unappealing edges and was laid out in an awkward path to the front door. It lacked both visual and functional appeal. How many times have you driven by a beautiful, custom-built home only to see a small, unappealing builder’s grade walkway out front? Maybe you’re even living in a home like that. Custom home builders are fantastic when it comes to building gorgeous homes. But more often than not, they add builder’s grade hardscaping to the front yard—almost as a rushed afterthought. 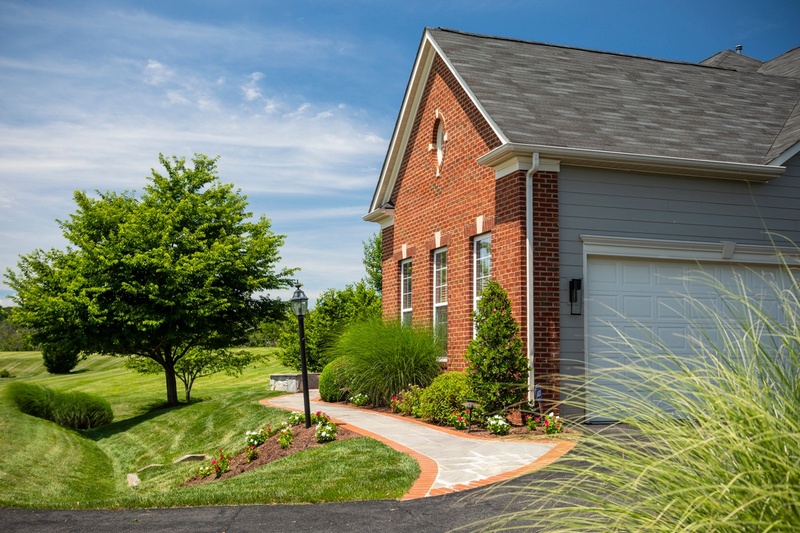 In this case, these Leesburg homeowners were frustrated that their classic brick home had a plain, concrete walkway leading up to it. They wanted something more formal and more elegant—something that better matched the caliber of their home rather than detracted from it. The solution required a complete renovation. 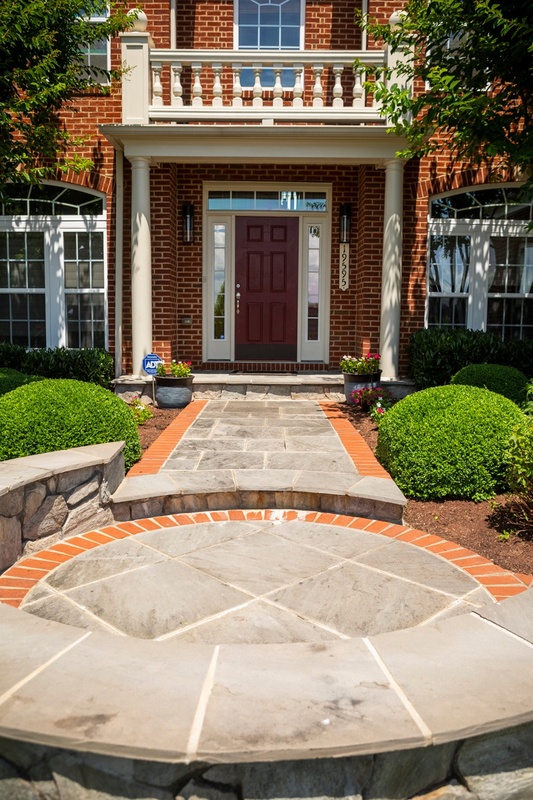 The new walkway in this Leesburg landscape design features a combination of natural bluestone with brick edging for a walkway that is a complement to their home. But it’s not just the material that was upgraded, it was the entire front landscape design. For one, the original walkway was so small that family and guests had to walk in a single-file line to get to the front door. This was not only awkward, it was unwelcoming. A walkway should be able to fit two people side-by-side walking comfortably to the front door. With the old walkway, even one person walking to the front door carrying bags felt as though they were dragging them through the bushes because it was so cramped. In addition, the walkway upgrade also features a circular “handshake area.” This is a spot where the homeowners and their guests can pause and say hello (or goodbye) as people come to and from their home. It’s a comfortable area to congregate rather than awkwardly trying to gather on the front porch. It also adds a tremendous amount of interest to the front yard, instantly serving as a curb appeal booster. It’s something unique that adds a lot of character. 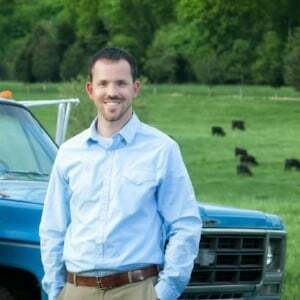 These Leesburg homeowners were also looking for landscaping that went beyond the couple of bushes that were planted without much thought or care. They wanted front yard plants that would actually add some interest and appeal. This was achieved with “layering” so that there was plant material of varying heights within the front beds. Layering plant material into the front yard adds a lot of visual appeal. It makes the landscape look “lush” and “full” in a way that several shrubs, all the same height, cannot. Another element that was important was that the homeowners wanted plant material that offered color year-round, not just in the spring. This is another common mistake made with landscaping. The property looks colorful and beautiful for only a few short months out of the year. However, with a thoughtful landscape design, you can have color year-round. We made sure to plant material that would keep this property looking lush and appealing throughout the year. 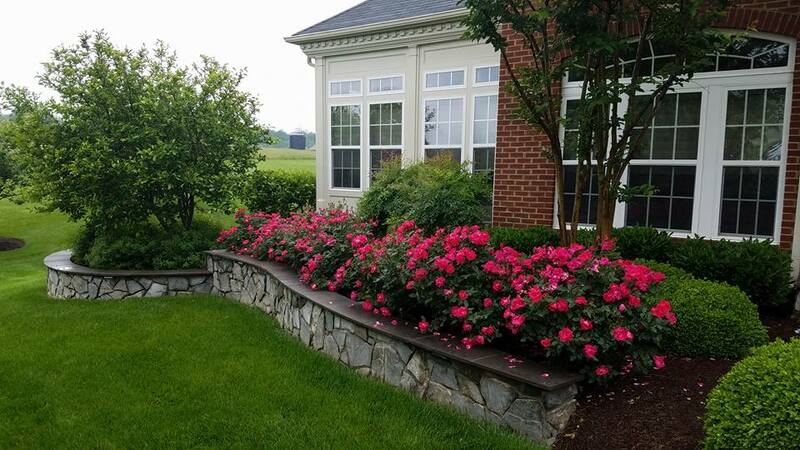 After completing the walkway and landscaping for this Leesburg, VA landscape design, the homeowners were so pleased with how their front yard was coming together that they brought us back to add a wrap-around stone wall. Although you can certainly sit on it while hanging out in the front yard, more than anything, it adds decorative appeal that helps this property stand-out as one-of-a-kind. The homeowners added it primarily for its aesthetic possibilities. It also helps to balance out the fact that the property drops off on the side. We have a magnolia tree planted in the area where it drops off to help add more balance and also soften the look a bit. It rounds out the entire front yard, making it look pleasing to the eye and more equally balanced. Another big addition to this Leesburg landscape design that cannot be overlooked was the installation of landscape lighting. The walkway is well-lit both for aesthetic appeal and for safety. With proper lighting, it is now easy to navigate, even after the sun goes down. We also added lighting to the “handshake area,” the retaining wall, and we uplit the crepe myrtle trees that we installed for added appeal. The end result is that the property looks truly stunning in the evening hours. It’s a show stopper. It’s the type of house that people drive by and say “wow” when they see it all lit up. Once we finished this Leesburg landscape design, we transitioned immediately into maintaining the property as well. The homeowners were incredibly happy with the end result and they wanted to keep it looking as amazing as it did when it was first finished. However, they recognized just how much work would be involved in keeping the front yard looking spectacular, so they handed those services over to us. Their desire was to have a worry-free landscape that always looked its very best—without having to add a lot of work to their already-busy lives. 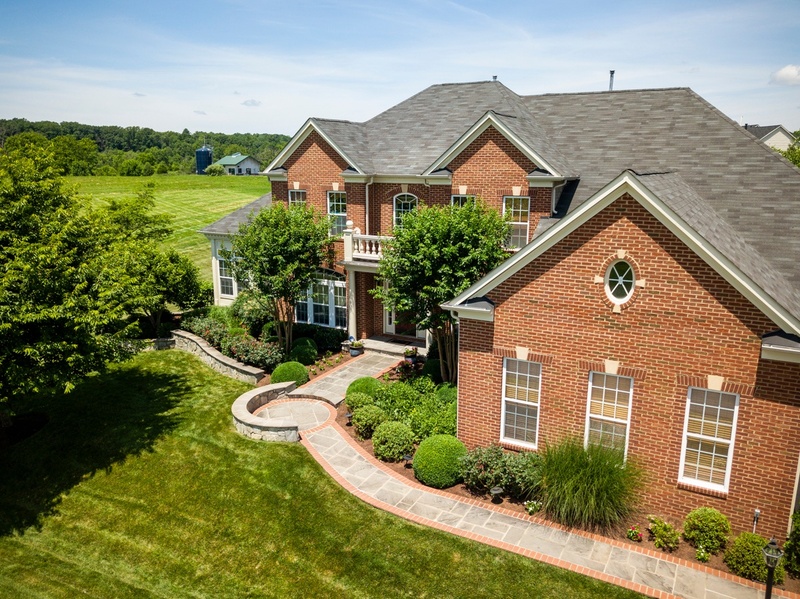 Our ability to seamlessly transition from design/build work into maintenance was helpful for this busy Leesburg, VA family. At the time when this article was published, we had been on the property for close to a decade, continuing to keep it looking as beautiful as it did the day it was installed. In the end, our goal for all of our customers is the same—and that’s to help make your home’s landscaping the envy of the neighborhood. 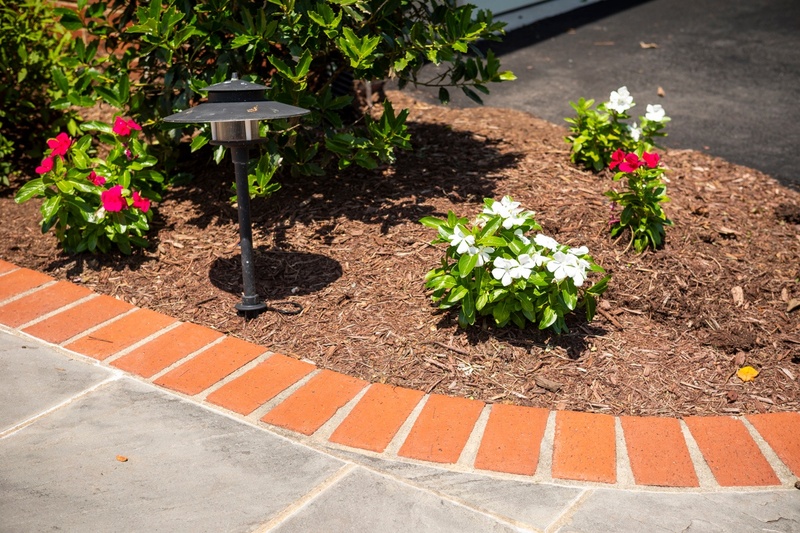 Whether that’s through a one-time landscaping project that you plan to maintain on your own or it includes ongoing maintenance services, we’re here for your needs. We want to help create a worry-free property where all you have left to do is enjoy the results. Whether you’re looking for a front yard landscape design or something else, we’re here for you. If you’re reading to bring your ideas to life at your Ashburn, Aldie, or Leesburg, VA home, talk to an expert, choose a solution that rocks, and then get ready to see your vision take shape.